We used to have to rely on luck to find the brilliant street art that’s littered across Staten Island’s north shore. Now, there’s a better way. 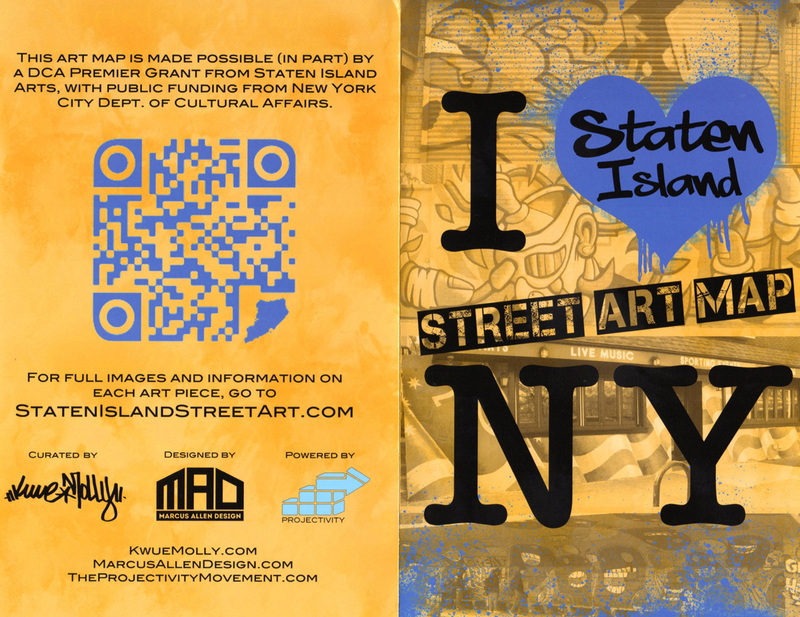 The Staten Island Street art map was curated by artist, Kwue Molly, designed by Marcus Allen, and powered by Projectivity. 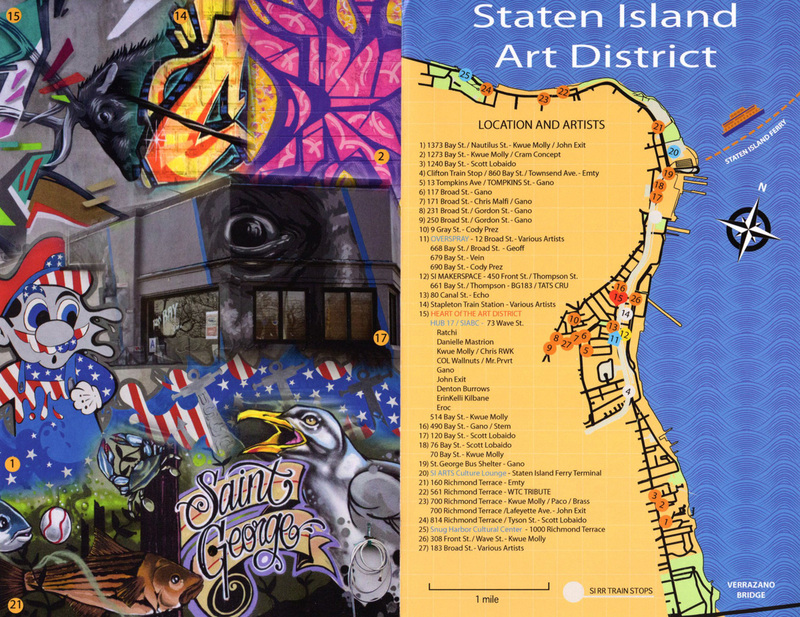 The map was funded by a grant from Staten Island Arts. Molly has worked on a number of art projects, most notably working with Ghostface Killah on the Pretty Tony and Fishscale/More Fishalbum; also participating in 2011 HOWL Festival in NYC, Art Basel in Miami in 2013, 1st Place in the Ink Monstr Sitcky Situation art event in NYC in 2013, and most recently painting live at the Governor’s Island 6th Annual Beach Party with Wu-Tang and the Lox performing. 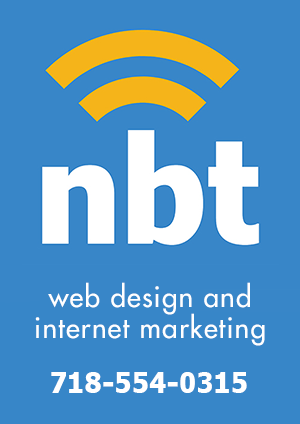 Marcus Allen, whose work you might remember from those Jay Z and Kanye West “Where’s Waldo” stickers that popped up a few years ago, has been active in the design world and works as a freelance designer. Projectivity is a collective of musicians, artists, teachers, business owners, and other community members who have come together to create various opportunities for the public to showcase music and art, in addition to offering resources and education in these fields. Remember to thank them all after you’ve taken your colorful guided tour of Staten Island Art. 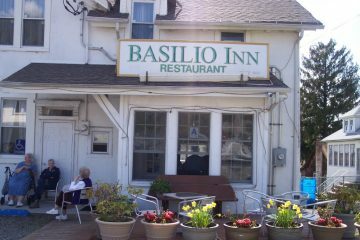 Artist, ErinKelli Kilbane is Painting Staten Island This Weekend.